Intel Israel’s Kiryat Gat chip manufacturing facility. The total amount includes $210 million from the Israeli government. Over the 25 years that Intel has been manufacturing chips in Israel, it has earned $1.2 billion in grants from the Israeli government. Currently, Intel produces processors that run more than 80 percent of the world’s personal computers. If you own a PC, chances are a part of it was produced in or developed in Israel. The core business in Israel is processors that run the central processing units (CPUs) in PCs. “Dealing with advanced technology, we have to hire skilled people. People working here have very high skill sets, education and experience,” says Bahar. Intel Israel’s “green” Development Center in Haifa. The employees at Intel Israel, under the supervision of general manager Maxine Fassberg, were reportedly very happy about the news. A strong year for Intel bodes well for them too, with each of the 7,057 employees earning a bonus of 3.2 months’ salary for their work in 2010 – a year in which Intel’s fourth-quarter earnings grew by eight percent from the previous year to $11.5 billion, and net profit grew by 167% to $11.7 billion. According to news reports, each employee will earn at least a $10,000 bonus, on top of a pay raise. In more good news, Intel Israel expects to hire an additional 1,000 employees over the next year. 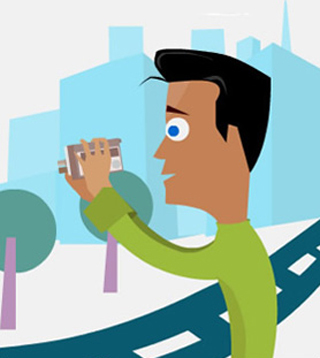 Starting Feb 28, the company will move from 45-nanometer to 22-nanometer chips. Fassberg said the Kiryat Gat plant is the second Intel facility in the world to produce these tiny chips. In other Intel Israel news, the latest “Sandy Bridge” microarchitecture for next-generation PCs, developed at the Haifa R&D center, has drawn a great deal of attention. Sandy Bridge, unveiled at the recent Consumer Electronics Show in Las Vegas following four years of development work by 1,000 engineers, will also help Intel PCs and laptops compete with tablets. Meanwhile, tech geeks are waiting to see what Intel Israel’s new Netbook processor, the Cedarview, will be like. Developed at Intel Israel’s Jerusalem center, this is expected to lead the next generation of Intel’s Atom processor. Intel Israel is also working on Light Peak, which will enable a high-speed data transfer rate of 10-gigahertz between computer and screen or between computer and storage device over a single wire. The end result? Thinner computers with fewer connections. Intel Israel, operating since 1974, was the company’s first development center outside the United States. It has facilities based in Haifa, Jerusalem, Kiryat Gat, Yakum and Petach Tikva. SDL building Israel’s largest desalination plant – Israel Business, Ynetnews. 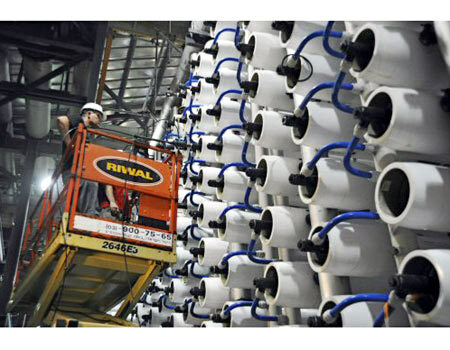 SDL Desalination Ltd said on Sunday it began construction of the world’s largest reverse osmosis desalination plant, hoping to alleviate Israel’s water shortage. The group said the new plant in central Israel will produce 150 million cubic meters of water each year, or about a fifth of household water consumption in Israel, and will be finished in 2013. SDL is 51% owned by IDE Technologies and 49% by Hutchison Water, a unit of Hong Kong group Hutchison Whampoa. Israeli conglomerate Delek Group owns 50% of IDE, with the other half owned by fertilizer maker Israel Chemicals. The group said in a statement the plant will produce water at a cost of around NIS 2.01 (56 cents) per cubic meter. Currently, the largest reverse osmosis plant – a technology that requires less energy to desalinate sea water and is friendlier to the environment than thermal-based systems – is in the northern Israeli city of Hadera. It produces 127 million cubic meters of water annually. FoxNews.com – Stuxnet Worm Still Out of Control at Iran’s Nuclear Sites, Experts Say. Aug 21: The first fuel is loaded into the reactor building at the Russian-built Bushehr nuclear power plant in Iran. EXCLUSIVE: Iran’s nuclear program is still in chaos despite its leaders’ adamant claim that they have contained the computer worm that attacked their facilities, cybersecurity experts in the United States and Europe say. The American and European experts say their security websites, which deal with the computer worm known as Stuxnet, continue to be swamped with traffic from Tehran and other places in the Islamic Republic, an indication that the worm continues to infect the computers at Iran’s two nuclear sites. The Stuxnet worm, named after initials found in its code, is the most sophisticated cyberweapon ever created. Examination of the worm shows it was a cybermissile designed to penetrate advanced security systems. It was equipped with a warhead that targeted and took over the controls of the centrifuge systems at Iran’s uranium processing center in Natanz, and it had a second warhead that targeted the massive turbine at the nuclear reactor in Bashehr. Stuxnet was designed to take over the control systems and evade detection, and it apparently was very successful. Last week President Mahmoud Ahmadinejad, after months of denials, admitted that the worm had penetrated Iran’s nuclear sites, but he said it was detected and controlled. The second part of that claim, experts say, doesn’t ring true. Eric Byres, a computer expert who has studied the worm, said his site was hit with a surge in traffic from Iran, meaning that efforts to get the two nuclear plants to function normally have failed. The web traffic, he says, shows Iran still hasn’t come to grips with the complexity of the malware that appears to be still infecting the systems at both Bashehr and Natanz. He said that while there may be some individual computer owners from Iran looking for information about the virus, it was unlikely that they were responsible for the vast majority of the inquiries because the worm targeted only the two nuclear sites and did no damage to the thousands of other computers it infiltrated. At one of the larger American web companies offering advice on how to eliminate the worm, traffic from Iran has swamped that of its largest user: the United States. Perhaps more significantly, traffic from Tehran to the company’s site is now double that of New York City. Ron Southworth, who runs the SCADA (the Supervisory Control and Data Access control system that the worm specifically targeted) list server, said that until two years ago he had clearly identified users from Iran, “but they all unsubscribed at about the same time.” Since the announcement of the Stuxnet malware, he said, he has seen a jump in users, but few openly from Iran. He suspects there is a cat-and-mouse game going on that involves hiding the e-mail addresses, but he said it was clear his site was being searched by a number of users who have gone to a great deal of effort to hide their country of origin. Byres said there are a growing number of impostors signing on to Stuxnet security sites. The implication, he says, is that such a massive effort is a sign of a coordinated effort. Ralph Langner, the German expert who was among the first to study and raise alarms about Stuxnet, said he was not surprised by the development. “The Iranians don’t have the depth of knowledge to handle the worm or understand its complexity,” he said, raising the possibility that they may never succeed in eliminating it. “With the best of expertise and equipment it would take another year for the plants to function normally again because it is so hard to get the worm out. It even hides in the back-up systems. But they can’t do it,” he said. And Iran’s anti-worm effort may have had another setback. In Tehran, men on motorcycles attacked two leading nuclear scientists on their way to work. Using magnetic bombs, the motorcyclists pulled alongside their cars and attached the devices. One scientist was wounded and the other killed. Confirmed reports say that the murdered scientist was in charge of dealing with the Stuxnet virus at the nuclear plants. Horizon’s AEROPAK fuel cell proves itself on Skylark I-LE UAS test flight. The latest test of Horizon Energy System’s AEROPAK fuel cell power system has seen it fitted aboard an Elbit Systems Skylark I-LE UAS (Unmanned Aircraft System) and put through its paces. Although the AEROPAK has been put to the test in other UAS aircraft, the official test flight recently carried out in Israel marked the first time a fully operational system using the AEROPAK – including take-off and recovery with an operational payload integrated onboard – has been tested. The Skylark I-LE is an electrically-propelled, tactical, silent, man-portable UAS that entered operational service in 2004 and is currently used by several countries for close range surveillance and reconnaissance missions. Elbit says equipping the aircraft with the AEROPAK fuel cell system will double the current flight duration of the UAS. Horizon’s AEROPAK power system is designed as a drop-in replacement for battery packs used in small electric UAS aircraft and delivers 900 Wh net usable energy per liter of fuel. To test the limits of the system, the test flight simulated real battlefield conditions and an actual payload. The Skylark’s AEROPAK-enabled propulsion engine was subjected to a number of operating scenarios including repeated take-offs and abrupt landings on various terrains to determine if the fuel cell was able to withstand high levels of shock. The UAS was also flown in windy and turbulent weather to gauge the AEROPAK’s capability to sustain continuous high power drain from the aircraft’s motor. Elbit says the AEROPAK fuel system passed the tests with flying colors, proving it is rugged enough for military use. “The AEROPAK has passed Elbit Systems tests and is now proven to be a ready drop-in replacement for battery packs currently in use. We are immensely proud of this achievement and believe that the AEROPAK powered Skylark I-LE will be an unparalleled combination,” added Richard Liow, UAS systems manager at Horizon Energy Systems. aol-buys-its-fifth-israeli-start-up from israel21c.org – StumbleUpon. In its fifth acquisition in Israel, US Internet giant AOL is buying Israeli start-up 5min Media. AOL confirmed the acquisition, which was reported in the technology blog All Things Digital.While the value of the deal was not reported it is estimated at up to $65 million. 5min Media was founded in 2007 by Ran Harnevo, who serves as chairman; Tal Simantov, chief marketing officer; and Hanan Laschover, chief technology officer. It’s a platform for instructional videos in a variety of fields that enables people to share their knowledge by uploading videos lasting up to five minutes. The company has raised $13 million to date, reportedly from venture capital funds Spark Capital and Globespan Capital, along with private investors. The private investors include Nehama Karpol, Ofer Lazovski, and advertising agency Adler Chomsky’s Grey Interactive Israel. This latest AOL acquisition in Israel follows ICQ-developer Mirabilis, Relegence, Yedda and Quigo. It was at about 9:30 last night when I spilled the pomegranate seeds on the floor. While picking them up, one by one, I reflected first on the story of Demeter and Persephone, then on the fact that some Jewish schoolchildren are taught that there are 365 seeds in a pomegranate (the number of days in the year) while others are taught that there are 613 (the number of mitzvot or good deeds), and finally (it took some time collect them all) about the long-standing Jewish relationship with the pomegranate as a symbol of fertility and plenty. Well, it has a lot of seeds so you can see why that might be. 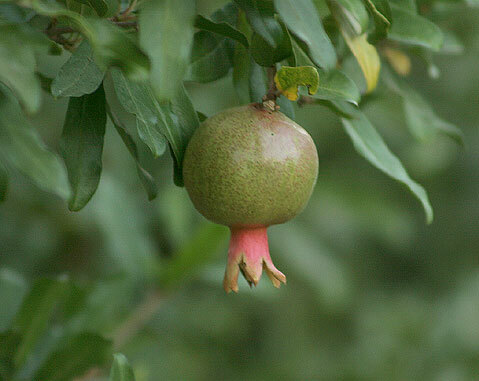 It’s hard to say where Judaism’s connection to this beautiful and fascinating fruit begins; some scholars believe is was the pomegranate, not the apple, that got Adam and Eve kicked out of the Garden of Eden. It is mentioned often in the Bible both as a fruitand as a symbol and is one with the Seven Species celebrated at Sukkot. 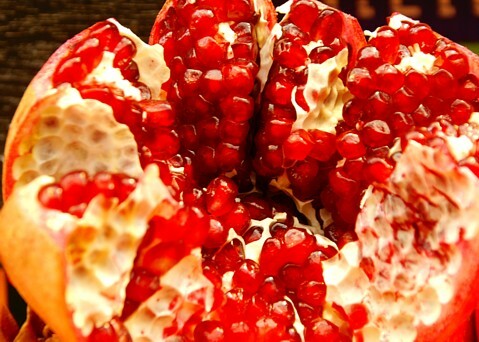 What is for certain is that the pomegranate has been in this region for thousands of years. According to the California Rare Fruit Growers (CRFG) site, “The pomegranate is native from Iran to the Himalayas in northern India and was cultivated and naturalized over the whole Mediterranean region since ancient times.” The pomegranate features prominently in this mosaic fruit basket from the Nabatean city of Mamshit. Also from CRFG: “The pomegranate widely cultivated throughout India and the drier parts of southeast Asia, Malaya, the East Indies and tropical Africa, and was introduced into California by Spanish settlers in 1769.” In those days, pomegranates and their juice were valued as much for their medicinal properties as for their beauty, but in modern times they were for decades nothing more than a martini mixer or an exotic decorative item. And then researchers like Dr. Ephraim Lansky, co-founder of Israel’s Rimonest came along, with proof — as reported by ISRAEL21c — of the pomegranate’s high anti-oxidant activity: “the stuff of potential anti-cancer therapies”. Israel wasn’t the first country to produce pomegranates for commercial export but — as always — is an innovator. Israel was first, for example to give pomegranate juice an upgrade via wineries such as Azarad and Rimon, which produce varieties such as dessert wine, port style wine and dry wine, all the while touting the fruit’s antioxidant properties. And Israeli pomegranate innovations don’t stop there: Shoham, inventors of a new gadget, the ART – Arils Removal Tool (that’s a pomegranate seed plucker to you and me), were recently awarded the 2010 Innovation Award at Fruit Logistica Berlin, one of the major events in the fresh produce industry. Here’s a picture of the happy Shoham team. An instructional video can be found on their website – and while it can’t prevent you from dropping the finished product on the floor, I can vouch that the ART actually does the job.